This is the school music blog for St Teresa’s School. We believe music is vital for our development. 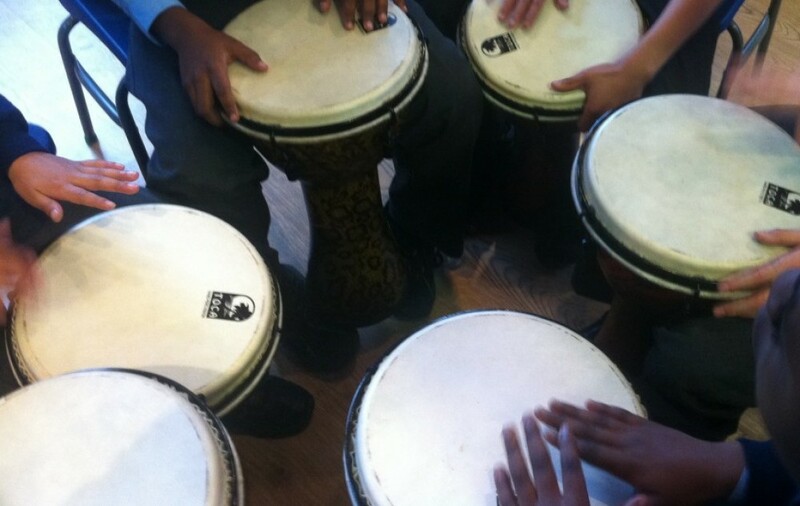 You can follow our blog to find out what we are learning, to listen to our music making and to learn more about music. learn to read and write stick notation. If you have any questions about our school music please leave a comment and we will get back to you. We are amazed at how many visitors we get from all around the world! We absolutely LOVE it when someone leaves us a comment and says hello – so if you have done,a big THANK YOU! Year 4 voxpops are telling me we are not allowed solos.Is that true? Year 6 are taking the big solos but anyone can have a small solo. Do you know what happened on Monday at school,Sue came into the music room and she taught us a song which made me think of the poor people which are suffering a lot .I feel very sorry for all of them.Mrs shnider is the best music teacher ever in the school! My comment is saying that the lessons so far are going very well.I love it when Sue taught us the song named for people will come and people will go.Mrs Schneider is actually right ,this is the most exciting thing about music ever! Thank you Mrs Schneider for arranging this up. Bye Bye . See you every Monday. do you know echoes, it was the best video clip ever !!!!! Can I just remind you Michelle not to leave your surname on the comment box. We always just use our first names for this blog. i really like the blog because it inspires you that anyone can do music or play an instrument it doesn’t matter if your bad at playing an instrument it just matters if you enjoy it. I enjoy seeing who else has achieved their goal on the blog. I enjoy reading some of the comments people have written about an instrument or how they like the blog. The blog is filled with fun facts and inspirational thoughts . These are my opinions from what I know and enjoy about St Teresa’s music matters. Come and talk to me and I will arrange to interview you! I hope that you forfill your dream and i know that you will do well!!!!! We will really miss you when you go to manchester but yesterday I loved the song and the website is excellent and brilliant.I loved the song when all the boys and girls joined in for the song. Tody I looked at this blog and saw how many poeple were on the the blog , that makes me really 😉 happy 😉 as we all made our school blog international and there were countries such as Taiwan, poland , austrailia and america. You can! What instrument would you like to learn? Mrs schneider I want to be a author because I would blog about all our music lessons. I would post many stuff about the royal albert hall and all the practice lessons for it . I would talk about the instruments we usually play. I would talk about visitors who come to help Miss Schneider do her music lessons. I would tell about how you play instruments very good. And sometimes there might be music competitions and I will talk about it. I would try to be a ICT Music person by telling people how to use laptops in music lessons,and what categories to go on if the teachers tell us,so I would post that in music matters. I would put ideas of what new instruments we would be using. Jason you make a very powerful and persuasive argument. I will talk to Mrs Schofield about getting you added as a contributor on this blog. Thank you for taking the time to outline your reasons so thoughtfully. I like the simpsons theme tune! There is a lot of things about St.Tereas ‘s music lessons. The reason that we came to england so we can have a better job and a better life, because in poland it was hard to get money and we couldn’t afford holidays. I this blog is great and there is more talent ever in the school. I like this blog because it is fun and interesting and you can show your family what you have been doing in music. and miss lille has done a lot of work in singing. Well done! You are the first person to answer the question explaining the difference between a xylophone & glockenspiel. Thanks for leaving such a positive comment. I am really glad you are enjoying working with myself & Ms Lilli! thank you for the cool stuff. i really love the simpson theme because he has lots of talent.